Pacifica, CA – In 1959, Postmistress Juanita Lombardi gathered together artists in the newly incorporated City of Pacifica, and 22 of them became charter members of the Art Guild of Pacifica. Their first formal exhibit was held at the Sea Bowl. 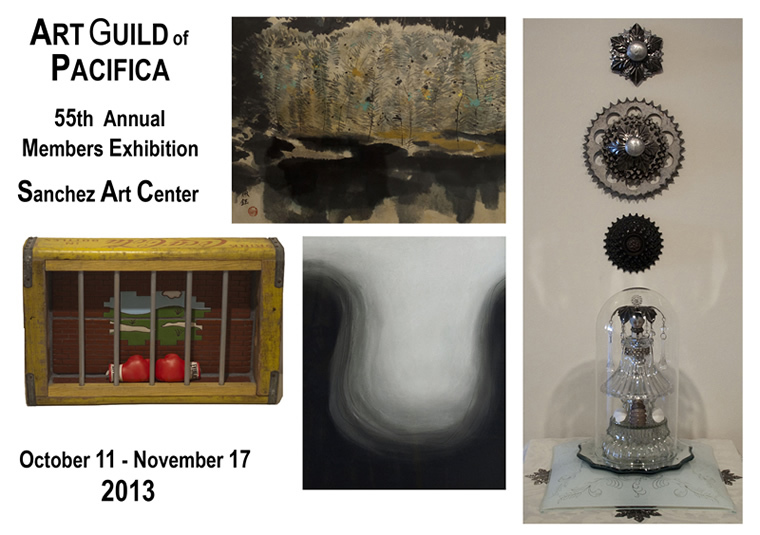 Since that time, Art Guild of Pacifica has accumulated almost 200 members, and there have been 54 member exhibitions. Powering along on the steam of its volunteers, AGP is the cornerstone of Pacifica’s art scene, providing artistic opportunities to its membership and thereby art to the community. The 55th Annual Members Exhibition opens on Friday, October 11, 2013, at Sanchez Art Center with a reception from 7 to 9 pm, and closes on November 17, 2013. The reception features live music and is free to the public. The winners of last year’s show, Eunice Chan, Nancy Hall, Stephen Hearne, and Melinda Lightfoot, will present their artwork in a group exhibit in the Main Gallery. Melinda Lightfoot won the 2012 exhibit award with her pastel piece entitled “Gray Areas (softly).” In her new pastel works, she delves further into this medium to discover brilliant color, soft edges, and many opportunities for blending. Lightfoot also experiments with the particulate nature of pastels to create an unblended overlay of color. Eunice Chan won with her piece titled “Night Shadows,” an infusion of watercolor and ink. Chan says she frequently finds herself intrigued with abstract elements: “I often start with a concept, and in developing it, the painting moves in a different direction. There is always the conflict between trying to bring it back to the original concept, or to proceed freely and see where it leads me.” The other Exhibition Award winners, Nancy Hall and Stephen Hearne, work in mixed media. Hall’s award-winning assemblage in metal and mirrors was entitled “Before Birth.” Hearne created a vocabulary all his own with his Coca-Cola crate constructions, such as “Break on Through,” which won him the award. These four artists were selected by Tim Berry, an accomplished and widely respected artist who is on the faculty of San Francisco Art Institute and University of California Davis. This year’s Annual Members Exhibition will be judged by Amir Esfahani, an accomplished artist currently on the faculty at Skyline College. Mr. Esfahani holds a BA from California State University Sacramento and an MFA from San Francisco Art Institute. He has exhibited in many galleries in the San Francisco Bay Area and throughout California. Visit artguildofpacifica.org for more information.